All 52 passengers from the Akademik Shokalskiy have now been rescued. All 52 passengers from the Akademik Shokalskiy have now been rescued. 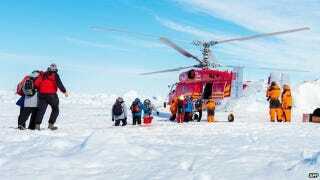 The ship had been trapped in Antarctic ice for nearly 10 days. The passengers were flown to the Aurora Australis in groups by a helicopter from a Chinese ice-breaker; the remaining crew of 22 are expected to stay on board the Shokalskiy until the ship becomes free.